George Hamilton-Gordon, fourth earl of Aberdeen, was Prime Minister of one of Britain’s rare coalition governments, despite never sitting in the House of Commons or holding a significant domestic post, but his reputation was damaged by his failure to prevent the Crimean War or to manage it well. His parents died by the time he was 11, in 1795, but he acquired as guardians two of the most powerful men in the country, the Prime Minister, William Pitt the younger, and Henry Dundas, who dominated Scottish politics for decades. He inherited the earldom of Aberdeen in 1801, together with heavily indebted estates in Scotland. After university he travelled in Europe, and was active in the House of Lords as a Scottish representative peer (holders of Scottish titles created before the Act of Union between England and Scotland in 1707 did not sit in the House of Lords by right but were allowed to elect 16 of their number to represent Scotland in the House). He accepted a diplomatic mission to Vienna in 1813, at an important time in the Napoleonic Wars. This was a sign of the government’s confidence in him and his interest in international politics. It led to a friendship with the Austrian statesman Klemens von Metternich, and promotion to the United Kingdom peerage in 1814. But he did not hold office again until 1828, devoting himself instead to his estates and his young family. He married Catherine Elizabeth Hamilton in 1805 and the marriage resulted in three daughters whom he adored (there was also a son who tragically died only an hour after his birth). When Catherine died of tuberculosis in 1812 Aberdeen never recovered: he wore mourning for her for the rest of his life. He re-married in 1815 and had five more children but by 1834 his second wife and all four daughters were dead. 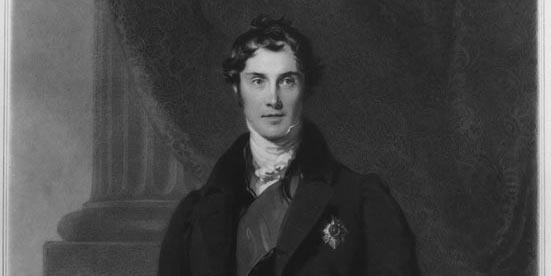 Aberdeen was Foreign Secretary in Wellington’s government between 1828 and 1830, and was reappointed to this post in Peel’s Conservative ministry of 1841-6. He developed a rivalry with Palmerston, the leading foreign affairs spokesmen for the Liberal party, though they were in different Houses of Parliament. Unlike Palmerston, Aberdeen consistently sought to smooth over tensions with other countries. He was much more sympathetic to the existing settlement in Europe than Palmerston was, and uninterested in using foreign policy to cultivate a liberal image in public. He also wanted to avoid heavy spending on defence, in order to help to keep taxes down. In the 1840s he worked hard to pacify Russia and pursued an entente cordiale with France, though he could not prevent the latter from collapsing in acrimony in 1844-5. He also dealt sensitively with several diplomatic problems in North America. Aberdeen supported Sir Robert Peel’s policy of repealing the corn laws and remained a trusted colleague of his after the resulting Conservative party split of 1846. When Peel died in 1850 he was treated as the leading Peelite, and was active in discussions over the next couple of years about creating a stable government out of the confused state of parties. The eventual upshot was the Liberal-Peelite coalition which Aberdeen formed as Prime Minister in December 1852. The Aberdeen coalition contained many talented individuals but they were difficult to handle. It displayed administrative ability – as shown by Gladstone’s pioneering 1853 budget, and the reform of the Indian Civil Service. But coalition politics were dominated by the deteriorating international situation. Russia and France aggressively sought to safeguard their position in the lands of the Ottoman Empire, fearing that it would soon collapse. The British were the other key power in the region, and needed to follow a consistent policy in order to maintain peace while securing their interests. Unfortunately, Aberdeen and the Peelites had one policy, which favoured reconciliation, and Palmerston, Russell and their followers had a much more assertive one. The Cabinet gave conflicting signals to the other powers, while the press fanned tensions between the politicians, making them unmanageable. When war was declared in March 1854, Aberdeen stayed in post, but the Crimean war was conducted badly and public hostility to the government grew. It was defeated in the Commons in February 1855 and Aberdeen resigned. He never held office again, partly because of the strong personal responsibility he felt for the descent into conflict. He died in 1860.